As we have explained before (see here) during Shabbat we can't turn on or off any electrical appliance or lights. However, it is permitted to program a timer (sha'on Shabbat) from Friday, before Shabbat begins, to turn on and off lights or some other electrical appliances. Modern Rabbis discussed the issue of modifying the time of the timer during Shabbat. For example, if I programmed the timer to turn off the lights at 10.30 p.m., and then I realize that I will need the lights for one more hour, can I reprogram the timer to turn off the lights at 11.30 p.m.? 1. First, it should be a manual timer (see for example this) , not a digital timer (see this ). A digital timer cannot be modified during Shabbat. 2. When dealing with a manual timer we would be allowed to move the knobs forward, but not back to turn the lights off or even on. We could move the knobs, for example, from 1.30 p.m. to 2.30 p.m., but not from 2.30 p.m. to 1.30 p.m..
3. 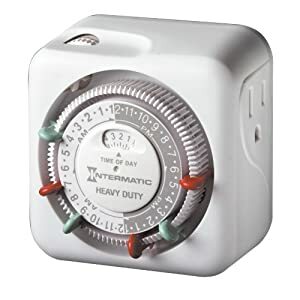 Rabbi Melamed says (Penine Halakha, Shabbat B, p.24) that in exceptional circumstances (sha'at hadaḥaq) most Rabbis would also authorize to reprogram the timer to turn off the lights at an earlier time. Rabbi Yosef mentions the case of a sick person (even in a non-life threatening situation) for example, if the lights don't allow him or her to rest. Similarly, in certain cases (leṣorekh Miṣva) we would be allowed to reprogram the timer to turn the lights on at an earlier time. Rabbi Yosef mentions as an example, Limud Tora. Shabbat ends in NYC: 5:38 p.m.
As we explained last time, the Mashiaḥ will be a Jewish King, descendent of the house of King David. According to Maimonides (MT, Kings 11:4) "We may assume that an individual is the Messiah if he fulfills the following conditions. (1) He must be a King, from the house of David, (2) immersed in the Tora and its commandments like David his ancestor. He must also follow both, the written and the Oral Tora, lead all Jews back to the Tora, strengthening the observance of its laws and (3) fight God's battles." "God's battles" are not meant here in a figurative sense like a salvation army. "HaShem battles" are the military wars and battles that the Jewish people wages against its enemies. The sort of battles that the IDF fights every single day. The Mashiaḥtherefore will be a man of wisdom, a leader and role model in Tora, and also a military man who fights against Israel's enemies. Where does Maimonides take these ideas from? In MT, Kings, 11:3 he writes : "Do not think that the Mashiaḥ will have to perform signs and miracles. He will not necessarily change the course of nature or bring the dead back to life [= teḥyiat hametim might not happen at this particular stage. Y.B. ], or anything else like that. We thus find that Rabbi Akiba, the greatest sage of the Mishna, was willing to accept Bar Koziba (Bar Kokhba, the leader of the Jewish revolt against the Roman Empire in 132 CE) as the Messiah until he was killed... it was only when he died that they realized ...that he was not the true Messiah"
It is through an analysis of the characteristics of Bar Kokhba that Maimonides describes the prerequisites of the Mashiaḥ: what rabbi Akiba saw in Bar Kokhba, we should expect to find in the potential Mashiaḥ. Rabbi Shemtob Gaguin(e) was born in Jerusalem in 1884. Rabbi Gaguin was a British Sephardic Rabbi and a descendent of a famous Moroccan Rabbinical dynasty which emigrated to Israel from Spain at the time of the Inquisition. He was the great-grandson of R. Hayim Gaguin, the first Chief rabbi (Chakham Bashi) of the Israel during the Ottoman Empire. In 1920 he accepted a position of Rabbi of the Sephardic community of Manchester and at the same time he was a Dayan (Rabbinical Judge) in the Manchester Rabbinical court (Bet Din). From 1921 he was the head of the Sephardic communities of London. Rabbi Gaguin died in Manchester, 1953. √ Shulchan Arukh, a critical study of the Jewish Codex based on several old editions and unpublished manuscripts. His most famous book is Keter Shem Tob, an encyclopedic treatise which examines and compares the Tefilot and traditions of the Eastern (Turkey, Israel, Egypt Syria) and the Western (Amsterdam, London, NY ) Sephardim, paying particular attention to the customs of Spanish and Portuguese Jews. The first two volumes were published in 1934. The final work comprised a total of 7 volumes, the last 3 of which were published posthumously with the help of his son, Rabbi Dr. Maurice Gaguine. Virtually all Siddurim (Jewish prayer books) that we have today begin with the prayer Mode (or Moda) Ani Lefanekha... "I thank You, Oh living and everlasting King, for You have returned to me my soul with [Your] compassion. Great is Your faithfulness". This is a short prayer of gratitude that is said when one wakes up in the morning. It is one of the best known prayers, although ironically, it was not mentioned in the Talmud or Shulchan Arukh. The first time this prayer appears is in 1599 in the book Seder haYom, written by the Mequbbal Rabbi Moshe ben Makhir from Tzefat (16th Century). The content of this beautiful prayer alludes to the idea (or motif) that the soul--the sensorial elements of it-- is stored by God and it is returned to us when we wake up in the morning. This idea is based on the Pasuq from the Psalms (31:5) beyadekha -afqid ruchi... "In your hands, oh God, I entrust my soul". With this prayer we express our gratitude to God for giving us back our spirit of life. "Mode Ani" paraphrases the belief formulated in "Elo-hay, Neshama...", which is the original prayer mentioned in the Talmud: when a new day begin and our inert bodies (pegarim metim) recover their vitality, we are virtually born again and for that new opportunity we thank the Almighty. Thus, our first thought and the first word that we utter everyday, is one of gratitude for being alive. Mode Ani was formulated to be said before we wash our hands (netilat yadayim) and this is why the name of God does not appear explicitly in it. God is referred to as the "living and eternal King". √ Click here to listen to "Mode Ani", the song. By Beny Elbaz. The text of the Ketuba is divided into three parts. The first part states all the basic data which is included in any legal document: the date, place and names. √ If we would write the Ketuba today, it would say "On the SECOND day of the week, on the TWENTIETH day of the month of MOR CHESHVAN, the year 5773 from the Creation of the World, according to the manner in which we count here in the city GREAT NECK, in the STATE OF NEW YORK." √ Then the text continues with the names. The name of the bridegroom is written first, followed by the name of his father and then the name of the bride and her father. Normally, the rabbi in charge of writing the Ketuba would state the Hebrew names followed by the English or vernacular names. For example, if someone's Hebrew name is YOSEF but everyone calls him JOEY the rabbi will write: YOSEF DEMITQARE JOEY, i.e., "Yosef also known as Joey". √ The names of the bride, the groom and their parents have to be written with extreme care. The rabbi in charge must be familiar with the rules and customs of writing names in Hebrew. Moreover, the rabbi must know how to write the English name in Hebrew letters, which many times is very complicated, since not every English consonants or diphthong has its exact correspondence in Hebrew. √If a person does not have an Hebrew name, the English or vernacular name can be used. √ In a case of adoptive parents, the custom in many communities is to write the name of the adoptive father adding: abiv hamgaddelo... "the father who raised him (o her)"
√ If a person is a Cohen or Levite, it should indicated after his name in the Ketuba. YOSEF BEN YA'AQOB HALEVY. This is a short sample of the adds which could be found in Facebook and all over the Internet last week. Thousands of Jewish families opened and are opening their homes inviting whoever needs to stay there.